UPDATE: As of September 19, 2016, Tropical Storm Julia has deteriorated to a remnant low and the National Hurricane Center will no longer issue advisories. MIAMI, Florida - NOAA's National Hurricane Center in Miami, Florida has issued a Public Advisory at 5 p.m. EDT on Sunday, September 18, 2016, due to the presence of Tropical Depression Julia off the coast of South Carolina. Tropical Depression Julia is stationary 110 miles southeast of Myrtle Beach, South Carolina. A turn toward the north is forecast to occur tonight, and that motion is expected to continue into Tuesday. On the NHC forecast track, the tropical cyclone is expected to be near the coasts of South Carolina and North Carolina by Monday afternoon or evening. Tropical Depression Julia has maximum sustained winds of 30 mph (45 km/h), with higher gusts. 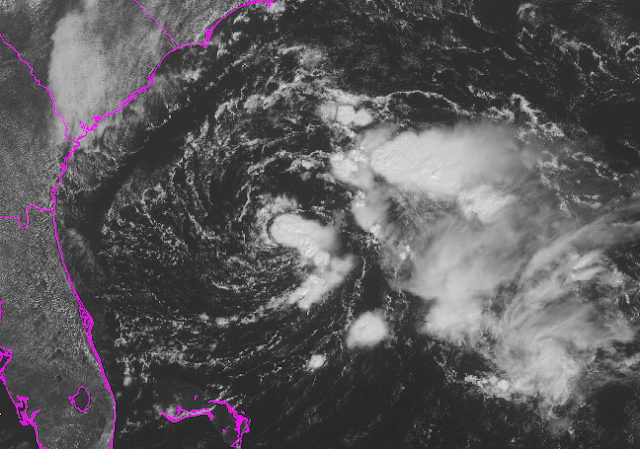 NHC forecasters say that some strengthening is possible during the next day or so. Spaghetti models are in general agreement that Julia will slowly meander towards the Outer-banks of North Carolina. After 48 hours, the computer models begin to disagree widely, which is also reflected by the circular "cone of uncertainty" drawn by the National Hurricane Center. Tropical Storm Julia is the first Atlantic named storm to form over land since 1988.